This is not the most rigorous way to think about or model price elasticity. Economists will not bother to give second look to this. If you write this up as your term paper you likely will get C or lower. But real life does not give us data on a platter. There are only imprecise data if any. We have to build the best possible model with available data to make timely decisions else we risk waiting for perfect data while our competitors lap us. Here is one such model, with all its imprecision and lack of rigor but tells us a whole lot about the tablet market’s price elasticity. 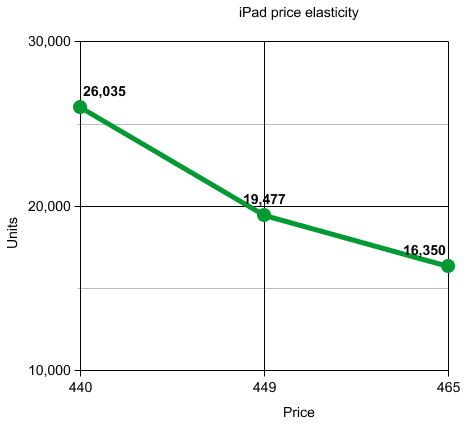 First take a look at the average selling price numbers for iPad over past 3 quarters. 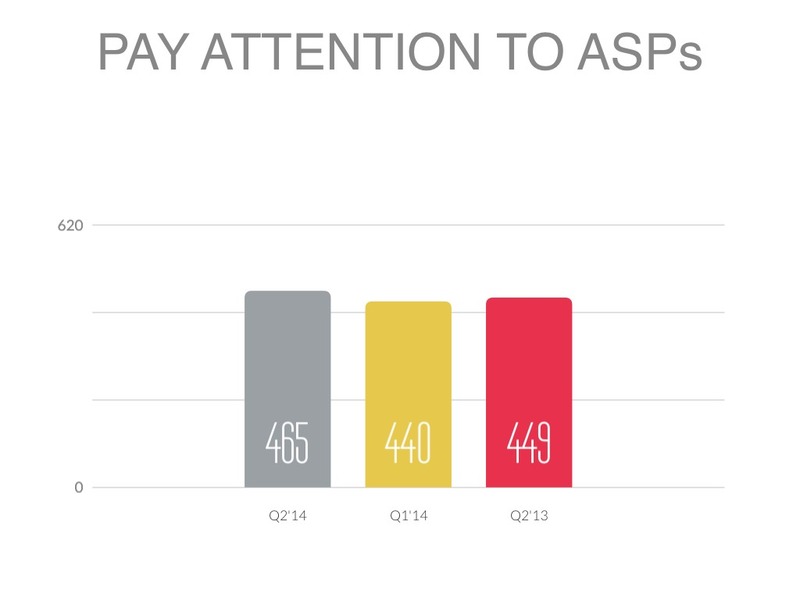 The numbers come to us from Apple’s Q2 2014 earnings report. Average Selling Price is not the actual price point. 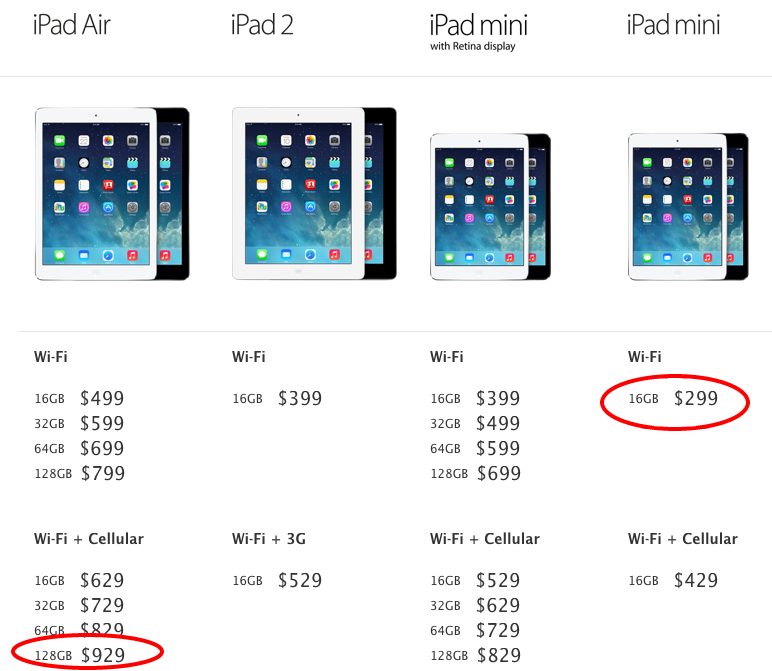 It is averaged over the price points of different versions of iPads Apple sells – from $299 mini to $929 128GB version. In any given quarter Apple sells different number of these iPad units based on customer preferences. Sum of all the revenue from all the unit sales is reported by Apple is revenue from iPad. If you divide that by the reported unit sales you get the Average Selling Price. Price elasticity represents change in quantity sold (volume) per unit change in price. If we have price points and the corresponding volume numbers we can plot a demand curve. The slope of the curve is price elasticity (assuming linear relation – but more technically you need to compute slope at each price point). A demand curve – plotted with price on x-axis and quantities on y-axis almost always slopes left to right (except for Veblan goods). Can we build this demand curve from Apple’s ASP and volume numbers? While the ASP represents the change in product mix for the quarter the underlying driver is customer mix change. Here ASP is a computed number, not the set price. It is not like Apple set prices different at three different quarters and found these volumes. But we indeed can use it as a proxy for actual price and build a demand curve. And when do that, what do we see? An incredible almost linear left to right downward sloping (as it should be) demand curve. That indeed can be used as a stand-in for customer’s willingness to pay for tablets. While you should not technically extrapolate, you could do that to find the volume at lower price points. There you have it – a view into the market for tablets giving its willingness to pay for iPad and in general tablets. What decisions you make with this is up to you.